How would you like to win a trip for four to Mexico City? Suppose the trip included four tickets to see the premiere of the new James Bond movie, Spectre? Starting today and running through October 15th, use the Android Pay mobile payment service at any location where it is accepted, to enter the contest. For each day that you use Android Pay, you are awarded one entry. The maximum number of entries allowed is 18. The contest is open to U.S. residents only. On October 19th, a winner will be selected at random. According to Google, the grand prize includes air travel, hotel accommodations, meals and on-demand car service for two nights. The winner gets the use of a personal stylist, and each of the four people on the trip are given a $1000 shopping spree. 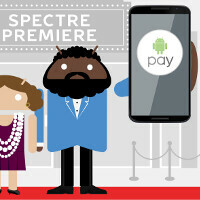 They each will also receive a $250 gift card, and new Android devices pre-loaded with Bond movies. The entire prize package is valued at $25,000. If you haven't downloaded Android Pay, it is now available in the Google Play Store. If you had previously installed Google Wallet, it should now be updated to Android Pay on your phone. Google Wallet is now a service for transferring money peer-to-peer, similar to PayPal. I'll wait for the Blu-Ray disc. I live here and I'm also asking myself that same question. Here the breakdown; Each person receives; 1) $1000 cash 2) $250 Pre-Pay Android Pay credit 3) A free Nexus phone 4) Air ticket and Hotel accommodation 5) Movie ticket, might even throw in the popcorn and drink :) Still pretty good. Is Mexican City a safe place to visit? It's a good city, you just need to avoid certain spots like Tepito and Iztapalapa. If you ever come here, concact me and I'll give you the "Taco Tour". Just imagine: suadero, pastor, bistec, carnitas, barbacoa, birria, pancita... excuse me, I'm going to get lunch. James bond okay. But as an added bonus you get to trade "Goods" with the cartel. (Online only; limited numbers, comes vanilla stock respectively). Ever heard of Android Wallet?